One of the greatest perks of having your own garden with plenty of fresh produce is to have your own basil plants for making basil pesto. 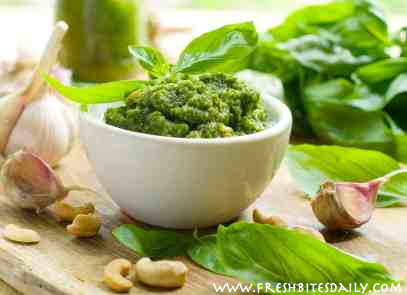 Basil pesto freezes beautifully, making this a key way of preserving the fresh brightness in basil. Of primary importance is using tender young leaves, not the ones that are shooting to seed. Watch the video here or check out the basil pesto video on YouTube. Pour pesto into ice cube trays or other small containers and freeze. A couple of hours will probably do the job. 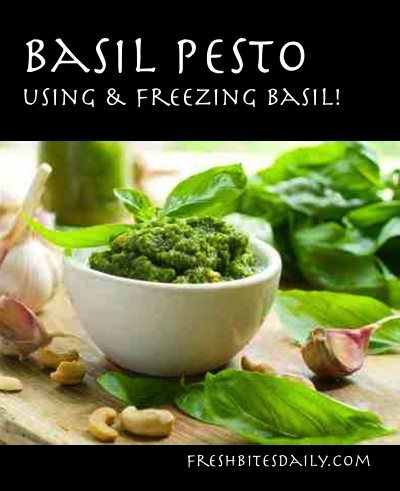 Pop the frozen pesto cubes loose and put your basil pesto into a freezer bag or other freezer container and return to freezer. These basil pesto cubes will keep nicely for about nine months, until your new basil crop comes in. Be brave and free in experimenting with your basil cubes. Use them with soups, sauces, vegetables and grains…not just the classic pasta (which is, of course, an exceptional way to use it your basil pesto). 4 Comments on "Basil pesto: Capture the brightness of basil & even store it for the winter"
I just purchased Parmesan cheese to make this! Thanks for a recipe that uses walnuts instead of pine nuts (difficult to find and expensive). This is a great way to use the end of the season basil… and awesome on homemade pizza! Do you have any suggestions for a nut-substitution? My husband is severely allergic to all nuts. But I looooove pesto. I always use sunflower seeds instead of nuts in my pesto, and it works great – roasted are best, and not salted, unless you want a very salty pesto! Hi… I’ve made pesto several times but this last time I started making it and found I was out of pine nuts and used toasted sunflower kernels as substitution. This is the first time that my pesto severely darkens, even with a fine layer of oil and covered in plastic wrap and lid. I use a 1/4c of lemon juice in my recipe which is why in the past I thought it did not darken. Could it be the sunflower kernels? I don’t notice a change in flavor but the color is unappetizing. Any thoughts?